Coyote Club is our after-school program from 1-3:30 pm. This option allows families to lengthen the school day for children currently enrolled in our forest school, and gives BFS graduates an opportunity to experience a bit of forest school as an after school enrichment program. During Coyote Club, we take a pause from all the activity that we have experienced during our busy day. We take a moment to rest, reflect, and acknowledge that we are held by this earth. Children in our forest preschool and kindergarten program often begin Coyote Club with a quiet cozy time to complement their active morning. Coyote Club children coming from other schools, where they may have spent the morning primarily indoors, may have more of a need to actively explore the environment as a way to settle into being here together. If a child's needs are to release wild energy though big movement, we have space for that. If a child's needs are quiet and soothing sensory input, we have space for that. If a child comes in ready to work in their nature journal, or build a fort, or go crayfishing, we have space for that. If a child is excited to play in a new adventure with their forest friends, we have space for that. A forest kindergartener works with teacher Liana to reignite a fire using their "fire whistle". Each day, Coyote Club teacher Colin is assisted by mentor Allie or art teacher Mariam. Together, teachers offer stories, songs, whittling, music, archery, games and campfire cooking to the children during their time together. Coyote Club takes place near our forest school locations. 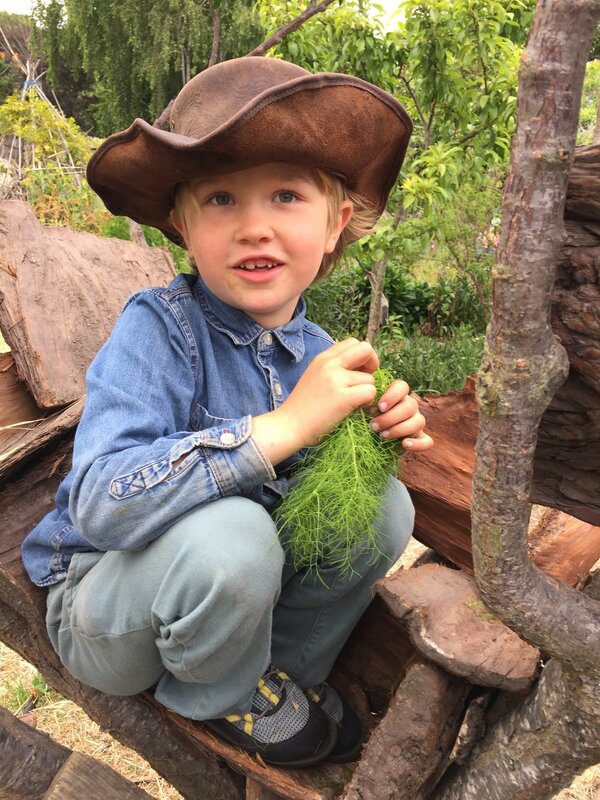 On Mondays and Tuesdays we are at an urban farm space in West Berkeley where we often grow and harvest fruit, veggies, and healthful herbs, and on Wednesdays and Thursdays, we are at a wooded creek in North Berkeley where we can forage wild plants and cook over campfire. Chamomile tea on a chilly day. After building a cozy fort for himself, this forest kindergartener takes a fennel snack break. Our flexible yet predictable schedule allows for children to feel comfortable and confident in the structure of the day. Here is an example of how a Coyote Club afternoon may look. Our transitions are determined by the needs and feelings of the group as a whole. 1pm—Children already on-site are invited to lay and rest, either listening to the birds or cloud gazing, etc. Some children may nap at this time. Children from other schools may continue to arrive until about 1:30pm, and often need to stretch and move their bodies, climbing and splashing as a way to connect with the space and settle in. 2 pm—Teachers begin to gather for a circle where we may sing songs, tell stories, and have a snack together. At this point, materials made available are presented to children. They are allowed to engage with these materials or play freely. This time belongs to the children, with teachers available for support. 3:30 pm—Parents arrive and children depart with them, dirty and happy.